CO2 Plume Geothermal systems (CPG) (Randolph and Saar, 2011a, b; Saar et al., 2012; Buscheck et al., 2013), involve injection of CO2 that comes from a CO2 emitter, as a working fluid to extract heat and pressure energy (enthalpy) from naturally high-permeability sedimentary or stratigraphic basins. The injected CO2 forms a large subsurface CO2 plume that permanently sequesters CO2 underground and absorbs heat from the geothermal reservoir. The CO2 plume can be “tapped” for thermal and/or electric power production in a geothermal power system (Randolph and Saar, 2011a; Saar et al., 2012; Adams et al., 2014, 2015). CO2-Plume Geothermal (CPG) systems can be combined with Carbon Capture and Storage (CCS), constituting a Carbon Capture Utilization and Storage (CCUS) system, or with Enhanced Oil or Gas Recovery (EOR/EGR). CPG systems can be direct, where the produced CO2 passes directly through a specialized CO2 turbine, or indirect, where a secondary power cycle is employed to generate electricity. Shown for comparison is also an Enhanced Geothermal System (EGS), where the permeability of hot but low-permeability crystalline basement rock is enhanced through hydraulic stimulation. Such EGS are much smaller in overall size and fluid flow is confined to fractures, so that significantly less geothermal energy can be extracted from such EGS, despite exhibiting higher temperatures that CPG systems. The heat density of sedimentary basins is typically relatively low. However, this drawback can be counteracted by the large accessible volume of natural reservoirs compared to the relatively artificial small reservoirs developed by hydro-fracturing (Dezayes et al., 2005). Furthermore, supercritical CO2 has a high mobility (i.e., low kinematic viscosity) and high thermal expansibility compared to water, resulting in the formation of a strong thermosiphon, which eliminates the need for parasitic pumping power requirements. Three-dimensional (3D), axisymmetric model with a cross section of the CO2-Plume Geothermal (CPG) reservoir showing grid discretization and placement of wells. The thermosiphon effect significantly increases the electric power production efficiency of the geothermal system compared to water-based geothermal systems. The produced power can then, for example, be used to drive the CO2 injection pumps if geologic CO2 is ongoing and/or it could be supplied to the electric grid. Because the produced CO2 is reinjected into the geothermal reservoir with the main CO2 sequestration stream, coming from the CO2 emitter, all of the CO2 is ultimately geologically sequestered resulting in a CO2 sequestering geothermal power plant with a negative carbon footprint. Alternatively, when geologic CO2 storage is uneconomic, CPG systems could also be operated with a limited, finite amount of CO2 stored underground and thereafter run with little or no additional makeup CO2. Such scenarios are investigated in this project. In keeping with the objective of formulating a simple model to gain first-order insights, we assume a homogeneous reservoir with a symmetrical CO2 plume formation around the vertical injection well. Therefore, a two-dimensional axisymmetric numerical model is formulated in cylindrical coordinates, representing a reservoir initially filled with native brine, that is gradually displaced by the injected, supercritical CO2. 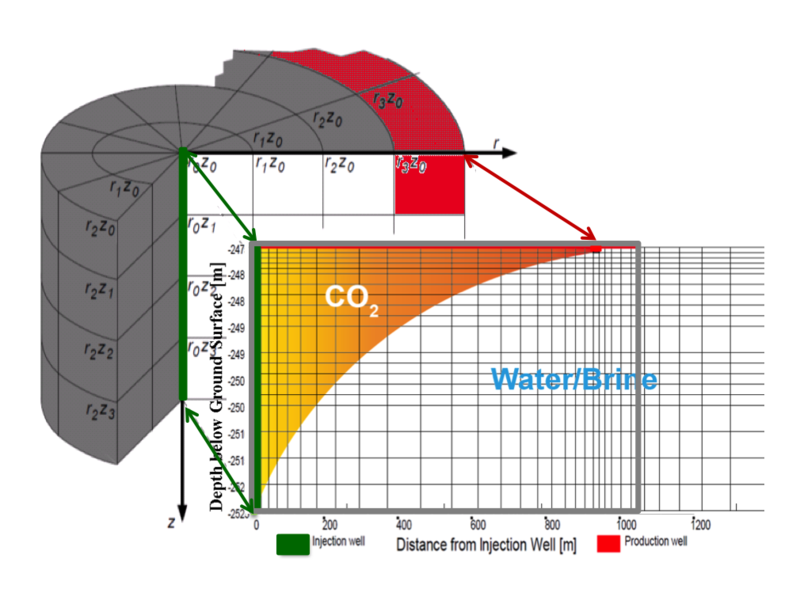 The CO2 enters the reservoir through a vertical, injection well. After moving through the geothermal reservoir, the heated CO2 is produced from a horizontal, circular production well (Noble, 1992; Gardes, 1995, 1998).We characterize the performance of such a CPG system as a function of heat energy output from the reservoir, reservoir lifespan or longevity given as reservoir temperature decline over time, and up-coning of the brine-CO2 interface into the inlet of the production well. The numerical simulator employed is TOUGH2 (Pruess et al., 1999; Pruess, 2004) with the equation of state (EOS) modules ECO2N (Pruess, 2005) and ECO2H (Spycher and Pruess, 2011), for reservoir temperatures at/below and above T=100°C, respectively. In this study the CPG system is operated in two stages, during the first stage CO2 is injected into the reservoir to develop sufficient CO2 plume formation by displacing brine between injection and production wells . During the second stage, the geothermally heated CO2 is produced and circulated to generate power. The performance of the system is analyzed based on: 1) the reservoir’s thermal energy extraction rate; 2) percentage of reservoir heat depletion over 20 years; and 3) approximate minimum CO2 mass fraction of 94% in the produced fluid, which is based on suggestions by Welch and Boyle (2009). The finite amount of initially injected CO2 required to operate a CPG system increases with increasing well spacing between injection and production wells, and reservoir depth, and decreases for locations with higher geothermal gradients. The shape of the CO2 plume depends on the permeability of the reservoir. Hence, permeability heterogeneity have a considerable effect on the performance of a CO2 Plume Geothermal (CPG) system. Reservoir heat depletion rates decrease with increase in well spacing between injection and production wells. Reservoir depletion is slow for thick reservoirs and moderate depths (2.5 km). Reservoir depletes at a faster rate at higher geothermal gradients. Garapati, N., Randolph, J.B., Saar, M.O., 2015. Brine displacement by CO2, energy extraction rates, and lifespan of a CO2-limited CO2-Plume Geothermal (CPG) system with a horizontal production well. Geothermics 55: 182-194. Garapati, N., Randolph, J.B., Saar, M.O., 2014. 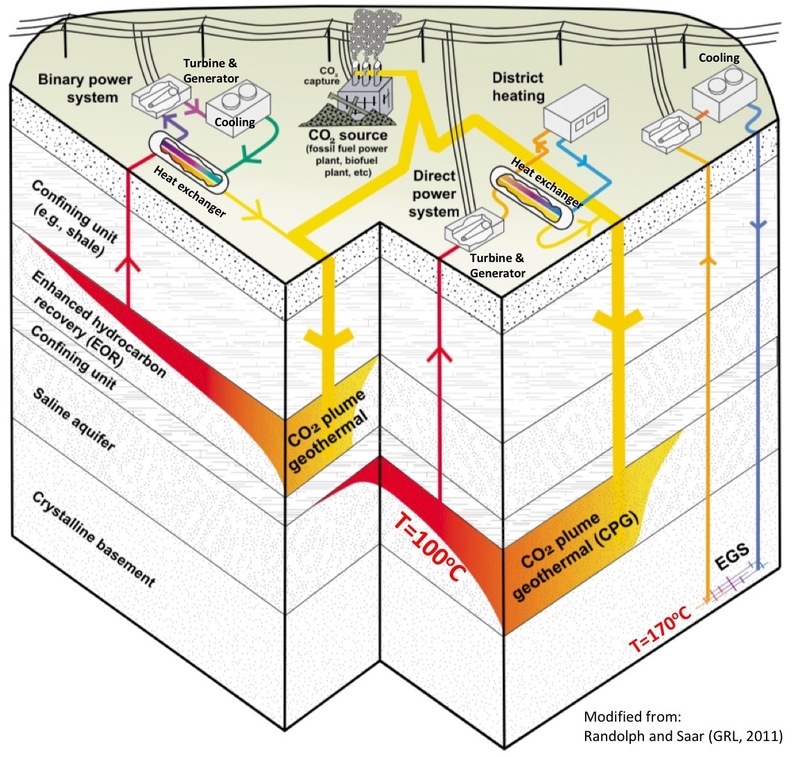 CO2-Plume based Geothermal (CPG) Heat Extraction in Multi-Layered Geologic Reservoirs. Energy Procedia 63: 7631-7643. Garapati, N., Randolph, J.B., Saar, M.O., 2014. Total Heat Energy Output from, Thermal Energy Contributions to, and Reservoir Development of CO2 Plume Geothermal (CPG) Systems. in Proceedings of the Thirty-Ninth Workshop on Geothermal Reservoir Engineering, Stanford Geothermal workshop, Stanford, CA. Adams, B. M., Kuehn, T. H., Bielicki, J. M., Randolph, J. B., & Saar, M. O. (2014). “On the importance of the thermosiphon effect in CPG (CO2 plume geothermal) power systems.” Energy 69:409-418. Adams, B. M., Kuehn, T. H., Bielicki, J. M., Randolph, J. B., & Saar, M. O. (2015). “A comparison of electric power output of CO2 plume geothermal (CPG) and brine geothermal systems for varying reservoir conditions.” Applied Energy 140:365-377. Buscheck, T. A., Elliot, T. R., Celia, M. A., Chen, M., Sun, Y., Hao, Y., Lu, C., Wolery, T. J., & Aines, R. D. (2013). “Integrated geothermal-CO2 reservoir systems: Reducing carbon intensity through sustainable energy production and secure CO2 storage.” Energy Procedia 37:6587-6594. Dezayes, C., Genter, A., Hooijkaas, G. R. (2005). “Deep-seated geology and fracture system of the EGS Soultz reservoir (France) based on recent 5km depth boreholes.” Proceedings of World Geothermal Congress, Antalya, Turkey. Gardes, R. A. (1995). Method of drilling multiple radial wells using multiple string downhole orientation. U.S. Patent No. 5,394,950. Gardes, R. A. (1998). Method and system for drilling underbalanced radial wells utilizing a dual string technique in a live well. U.S. Patent No. 5,720,356. Noble, J. B. (1992). Directional drilling apparatus and method. U.S. Patent No. 5,113,953. Pruess, K., Moridis, G., Oldenburg, C. (1999). TOUGH2 user’s guide, version 2.0: Lawrence Berkeley National Laboratory Berkeley. Pruess, K. (2004). “The TOUGH codes—A family of simulation tools for multiphase flow and transport processes in permeable media.” Vadose Zone Journal 3 (3):738-746. Pruess, K. (2005). ECO2N: A TOUGH2 fluid property module for mixtures of water, NaCl, and CO2: Lawrence Berkeley National Laboratory Berkeley. Randolph, J.B., & Saar, M. O. (2011a). ” Coupling carbon dioxide sequestration with geothermal energy capture in naturally permeable, porous geologic formations: Implications for CO2­ sequestration.” Energy Procedia 4:2206-2213. Randolph, J.B., & Saar, M. O. (2011b). “Combining geothermal energy capture with geologic carbon dioxide sequestration.” Geophysical Research Letters 38 (10). Saar, M. O., Randolph, J. B., & Kuehn, T. H. (2012). 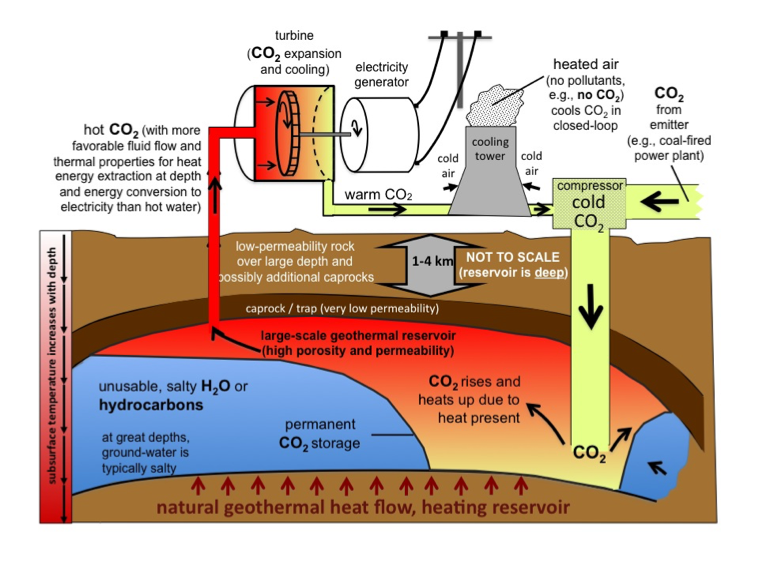 Carbon dioxide-based geothermal energy generation systems and methods related thereto. U.S. Patent No. 8,316,955 (International patents pending). Spycher, N., Pruess, K. (2011). “A model for thermophysical properties of CO2-brine mixtures at elevated temperatures and pressures.” Proceedings Thirty-Sixth Workshop on Geothermal Reservoir Engineering, Stanford Geothermal workshop, Stanford, CA. Welch, P., Boyle, P. (2009). “New Turbines to Enable Efficient Geothermal Power Plants.” GRC Trans 33:765-772.